According to the Environmental Working Group (EWG), the average American wastes 250 lbs. of food each year. Humans are responsible for nearly 40 percent of the food thrown away each year, and places like grocery stores and restaurants are only responsible for about 10 percent of food waste. Instead of relying on businesses such as restaurants and grocery stores to take action, it’s actually humans who need to take action. During Thanksgiving and New Year’s, Americans generate an additional 5 million tons of household waste. This Thanksgiving, you and your family can take steps to reduce food waste in your home during the holidays and all year long. The Department of Agriculture and the Environmental Protection Agency have recently joined forces to set a goal of reducing food waste by half in the next 15 years, but your help is needed in order to reach this goal. Since individual households make up nearly half of all food waste in the United States, we certainly have a long way to go. The good news is that each and every one of us can take action, starting with how we prepare our meals at home, especially during the holidays. 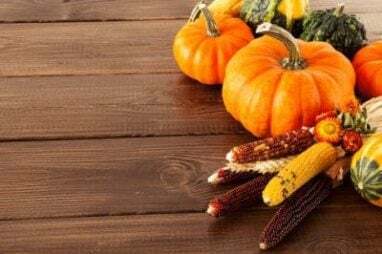 Plan your Thanksgiving meal: To ensure that you don’t have an unnecessary amount of food after your Thanksgiving dinner ends, plan your Thanksgiving meal in advance and don’t double or triple the recipes unless you know for certain that the food is going to be eaten. Donate unopened ingredients: While you won’t want to donate pre-made food to homeless shelters, you can donate any unopened or unused ingredients. Any extra cans of vegetable broth, green beans, or even shelf-stable almond milk can be donated to food shelves instead of letting them sit in your cupboard. Use your leftovers: If you know that you’re not going to eat the same meal over and over again after Thanksgiving, then come up with recipes that will you allow you to use up your leftovers. Add turkey to sandwiches or soups, turn your sweet potato casserole into veggie burgers, and use your mashed potatoes as a pizza topping. Have an environmentally-friendly meal: In addition to the great health benefits of a plant-based diet, you can also reduce your food and water footprint by going vegan, either full-time or part-time. To produce a typical eight-person American Thanksgiving dinner, around 48,000 gallons of water are needed. You can greatly reduce your water footprint by eating plant-based. Check out this collection of Thanksgiving meal ideas from BuzzFeed. Shop in the clearance section: Check out the clearance section at your grocery store to save money and keep these foods from ending up in the landfill. Use FoodLoop to find clearance groceries in your area. Forget the peeler: Save time and don’t peel carrots, potatoes, cucumbers, and other fruits or vegetables with skins. Instead, wash and scrub them before using. Plan your meals each week: Not only will meal planning save you time on weeknights, it will also save you money. Spend some time each week meal planning for the week, estimating how much you’ll have for leftovers, and whether or not you will freeze the leftovers or eat them for lunch the next day. Make a grocery list: After you plan meals for the week, write your grocery list. This also saves you time and money since you’re writing down the only ingredients you’ll need for the week. It may even teach you to be more creative with your meals! Make smoothies: If you have any leftover produce at the end of the week, or if you know you won’t have a chance to use it as planned, make a green smoothie or freeze any unused fruit. Basically any fruit or vegetable can be added to a smoothie and it’s a great way to use up any leftover produce. Ignore sell-by labels: While you shouldn’t completely ignore sell-by and use-by labels, you should think twice before throwing an item away just because the use-by date has passed. Use your own judgement before consuming something or throwing it in the trash. At Wheels For Wishes, we encourage recycling as much as possible. We run a car donation program that puts your unwanted car to better use, while also benefiting local Make-A-Wish chapters at the same time. Recycle your vehicle through Wheels For Wishes and let your car, truck, boat, or motorcycle help to grant wishes for kids in your community. Call us at 1-877-431-9474 or fill out an online car donation form. Since we’re getting closer to the end of the year, now is the perfect time to donate a car. Donate your car before 11:59 p.m. on Dec. 31 and your tax-deductible donation will count toward this year’s taxes. Donate a vehicle today!